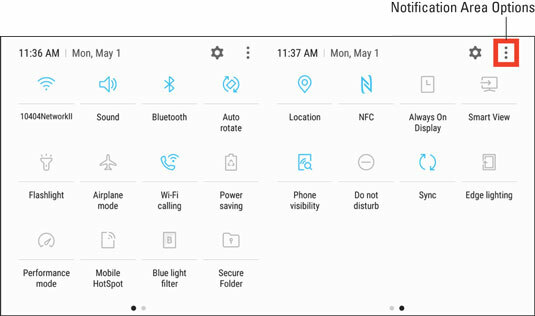 The notification area is located at the top of the Samsung Galaxy S8 smartphone. Here, you see little status icons. Maybe you received a text or an email, or you’ll see an application needs some tending to. Think of the notification area as a special email inbox where your carrier (or even the phone itself) can give you important information about what’s happening with your phone. These little icons at the top tell you the condition of the different radio systems on your phone: The number of bars shown gives you an indication of signal strength, and usually the phone will also tell you what kind of mobile data speed you’re getting — such as 3G or 4G. You could take the time to learn the meanings of all the little icons that might come up, but that would take you a while. A more convenient option is to touch the notification area and pull it down, as shown here. The rest of the screen is written so that you can understand what’s going on and what, if anything, you’re expected to do — for example, if you see that you have connected to the Wi-Fi access point you intended. When you’re finished reading the notifications, you slide your finger back up to the top. If this screen gets too full, you can clear it by tapping the Clear button. You can also clear notifications one at a time by touching each one and swiping it to the side. If you want a shortcut to control some key phone capabilities, you can tap one of these icons. For example, if you want to turn off Wi-Fi, you could just tap the Wi-Fi icon. This would save you from having to get in to Settings to do the same thing. If you want to add more of these, simply tap the three vertical dots highlighted in the preceding figure to see your notification area options. These are seen here, although you may have slightly different choices on your phone. For example, many people find the Flashlight capability to be handy. 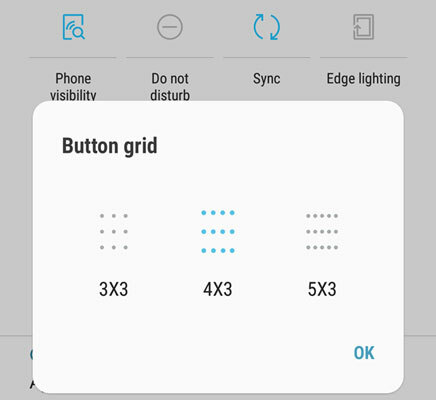 If it is not already there when you pull down the notifications screen, see whether it is among the options. If it is, press and hold on the flashlight icon. Then drag it to the top. The other icons scatter, and then you release it. You turn on the flashlight by tapping it. Try it and see.